Y'all. I spent four hours this afternoon selecting lights for the new house. Four hours. That was on top of the four hours spent last week doing a walk through with the electrician. I knew this would likely be the most stressful of the stresses, I mean selections. Let's just say we wrapped it up with a margarita which is how all new home lighting selections need to conclude. For some reason I imagined the electrical walk through was all about where we want/need lighting. 'Tis that, and so much more. It's also about precisely where you want the switches for said lighting. And do you want those switches on the left side of the wall or the right side of the wall? The wall that isn't even a wall yet, so imagine the wall is there and decide if you'll want to hit a switch left or right. And what exactly will each and every switch control? When you enter your house from the garage do you want to have to walk across the room to turn on a light? No. Okay, so which lights should come on then when you enter from the garage? Do you want all the lights in the room to come on or just the chandelier? Dimmer or no dimmer? Recessed lighting plus an actual light or just recessed lighting? How many cans? Where will you plug in your computer in the office that's not yet an office? What wall will the TV sit on? How will you arrange the furniture and will you you need an outlet in the floor of your great room? And that's just the teeniest bit of the showroom, a miniscule amount of what's on display. Let's not even discuss all the catalog options. We started off without too much trouble, selecting lighting to hang beside our front door. We knew what we were looking for, the very helpful sales rep found two or three choices, and we chose. Whoohoo! Go us! A couple of lights in and we're feeling pretty pleased with ourselves. Ha! We moved into the showroom and the decorator and I landed on the most fabulous chandelier we knew would be perfect in my dining room. Hubs took a little convincing so we set it aside and moved on to the chandelier for the great room. I took a little convincing so we moved on to lighting for the kitchen island. Back to the dining room. Back to the great room. No forget that first option, let's now do this light in the kitchen. Does it come in oiled bronze? Smaller? Bigger? Yes we love the dining room. That chandelier will be fabulous in the great room. If that's going in the great room let's put this in the foyer. Wait, what about the kitchen? Back to our first love, and BAM! Settled. All that was left after that were all the bathrooms, closets, laundry room, office, lower level great room, garage, porches, and oh yes, ceiling fans. 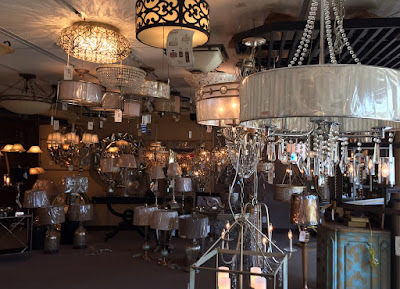 At one point between the second pass at the dining room chandelier and the third go round with the kitchen lighting hubs got on his phone and began furiously texting the builder to come rescue him. No dice, but I did promise a margarita if when we finally wrapped it up, and he re-joined the game. Also, I'm in love with my dining room chandelier in the same way I love beautiful pottery. Looking at it makes me smile. Remember when lighting was for light? Well lighting is art now, and while the recessed lighting shines enough to let you know you've grabbed an onion not an apple, the rest is for looking pretty. And that's okay because I like pretty. I'm overwhelmed just reading about it! Oh my gosh!! That's all I can say!! Decisions...funzies! I'd probably just choose all ceramic fixtures (like we have in our closets here) for everything until I could decide on my own without someone breathing down my neck for a decision. I don't do too well with someone pressing me for a decision. How much longer before you get to move in? You guys rock the quick decisions, to choose all that in one day ! Bless your heart! Bless your hearts, you deserve that margarita! Sounds a lot of decision making before the walls are even in. I get that you'd need to know where the lights should be and the switches/sockets and so on. But the actual chandeliers? Lamps? I think I've have been putting that off until the house was a bit more there. And it's very hard when you are not in yet. I can remember when we moved into our first house and it needed a rewire. Our electrician was like wait a couple of months until you're settled and REALLY know where you need the lights and sockets. I guess with sockets go with as many as you can. Better to have more than you need than have to add them after. But then there's always the BUDGET lol. Good luck with it all. Funny that you should blog about location of light switches. When I replaced two of my doorwalls, I had them reverse the sides that open. That means that the light switches are on the far side of the opening. Logically, they should have opened that way from the beginning if you look at the layout of the room and furniture placement. It just didn't come up during the building process.